Urban Meyer III (born July 10, 1964) is the head football coach of the Florida Gators football team that represents the University of Florida located in Gainesville, Florida ; he previously coached the Bowling Green Falcons football team from 2001 to 2002, and the Utah Utes football team from 2003 to 2004. Meyer is best known for coaching the Florida Gators to two BCS National Championship Game victories during the 2006 and 2008 seasons. In 2004, Meyer was recognized as the college football "coach of the year" by both sportswriters (Eddie Robinson Coach of the Year) and television commentators (Home Depot Coach of the Year Award). He has 20 years of college coaching experience, including eight as a head coach. His overall record as a head coach through the end of the 2008 season is 83–17, and he is 41–13 in conference play. His winning percentage (.830) ranks second nationally among active college coaches. Meyer spent one season interning as a defensive backs coach at Saint Xavier High School in Cincinnati, Ohio in 1985, where he met members of the Ohio State coaching staff. His first collegiate coaching position was a two-year stint as a graduate assistant at Ohio State. He then spent the next 13 years as an assistant—two at Illinois State, six at Colorado State, and five at Notre Dame. In 2001, Meyer took his first head coaching job at Bowling Green. In his first season there, he engineered one of the greatest turnarounds in the NCAA football history, going 8–3 and capping off the season with a 56–21 victory over Bowling Green's rival, the University of Toledo Rockets. He also earned Mid-American Conference coach of the year honors. The next year, Bowling Green finished with a 9–3 record. After a 17–6 overall record, Meyer left for the University of Utah. After two seasons at Bowling Green, he took the job at Utah in 2003. In his first year there, Meyer was named the Mountain West Conference's Coach of the Year with a 10–2 record, the best ever for a coach's first season at Utah. He also earned honors as The Sporting News National Coach of the Year, the first Utes coach to do so. Meyer's success can be attributed to his unique offensive system, which is an offshoot of Bill Walsh's West Coast Offense, relying on short pass routes. Meyer's base offense spreads three receivers and puts the quarterback in shotgun formation. Then, he introduces motion in the backfield and turns it into an option attack, adding elements of the traditional run-oriented option offense. In 2004, Meyer led the undefeated Utes to a Bowl Championship Series bid, something that had not been done by a team from a non-automatically qualifying BCS conference since the BCS' creation in 1998. He remained at Utah long enough to coach the team to a Fiesta Bowl win over Pittsburgh, capping off the Utes' first perfect season (12–0) since 1930. In the wake of his accomplishments at Utah, both the University of Florida and the University of Notre Dame vied for his services. Meyer chose to become Florida's head coach for the 2005 season, signing a seven-year contract worth $14 million. He later signed a six-year contract extension with the Gators on June 7, 2007; the extended contract paid an average of $3.25 million per year. On August 3, 2009, Meyer received another contract extension that made him the SEC's highest paid coach during the 2009 season; his 2009 extension is worth $24 million over six years. At the time of the latest contract extension, Meyer was the third highest paid college football coach, behind only Pete Carroll and Charlie Weis. 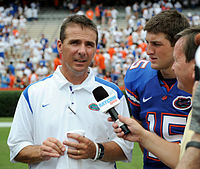 In 2005, his first season at Florida, Meyer's Gators team finished the season 9–3 (5–3 in the Southeastern Conference). The season included an undefeated record at home and a bowl victory against Iowa in the Outback Bowl in Tampa, Florida . The Gators would have faced LSU in the , but they lost to and former Florida coach Steve Spurrier in the SEC regular season finale. Instead, the Gators' rival, the Georgia Bulldogs, took the SEC Eastern Division title to the championship game, ultimately defeating LSU. In his second season at Florida, Meyer coached the Gators to a 13–1 (8–1 in the SEC) record, with the one loss coming on the road at Auburn, and SEC wins at home against South Carolina, , Alabama, and LSU; on the road at Tennessee and , with another win over rival Georgia. After clinching the SEC East, the Gators won the on December 2 over Arkansas by a score of 38–28. The Gators blew out the Buckeyes, 41–14, in the 2007 BCS National Championship Game to win the national championship. It was the first BCS bowl berth for the Gators since the Orange Bowl that capped off the 2001 campaign, and Florida's first national championship appearance and victory since winning the 1997 Sugar Bowl. Meyer has been known for winning big games. In addition to his 5–1 record in bowl games (as of 2008) at Florida, Meyer has an 11–1 record (through the end of 2008) against three of the Gators' biggest opponents—Tennessee, Georgia, and Florida State—and a 14–2 home record. The Gators managed a 9–3 regular season record in 2007, including blowout wins over rivals Tennessee and FSU. Quarterback Tim Tebow also became Coach Meyer's first Heisman Trophy winner. The team led the conference in scoring, but struggles on defense made it difficult for the Gators to reach a BCS bowl game. The Gators lost the to Michigan 41-35 on January 1, 2008. Meyer served as a pre-game and halftime analyst for the 2008 BCS National Championship Game. In 2008, Meyer led the Gators to a 13-1 overall record and the BCS National Championship over Oklahoma, including wins over six ranked teams. The team's lone defeat came at the hands of Mississippi on September 27, 2008, a game in which Florida led in time of possession and passing yards, but turned the ball over three times. 11 of the 12 Gator wins in the 2008 regular season were by 20 points or more. On December 6, 2008, Meyer led the Gators to a 31-20 victory over then #1 ranked Alabama in the SEC title game. Leading in time of possession, rushing yards, and passing yards, the Gators would come from behind after a third quarter deficit to score two touchdowns and hold Alabama scoreless in the fourth quarter. The victory would vault Florida to #1 in the Associated Press Poll, #2 in the USA Today Coaches' Poll, and #2 in the BCS rankings, setting up a showdown against Oklahoma in the BCS Championship Game on January 8, 2009, at Dolphin Stadium in Miami, Florida. The Gators defeated Oklahoma 24-14 to win the National Championship. Urban Meyer's teams at Bowling Green, Utah, and now Florida have all run the spread, chiefly utilizing a run-first variation most similar to Rich Rodriguez's at West Virginia with tweaks to fit the offensive personnel (for example, Meyer's first two years at Florida skewed toward a drop-back passing attack led by Chris Leak, while Alex Smith and Tim Tebow led an option run-based spread). Using this offense, he has won two BCS titles, has become the first coach to lead a non-BCS conference team (Utah) to a BCS bowl, has coached a Heisman trophy winner (Tim Tebow), and has graduated a player who became a number one overall draft pick (Alex Smith). Meyer was born on July 10, 1964 in Toledo, Ohio and moved to Ashtabula, Ohio as a child. He graduated from Ashtabula's Saint John High School . Meyer was also selected in the 13th round, as a shortstop, by the Atlanta Braves in the 1982 Major League Baseball Draft. Meyer spent two seasons playing minor league baseball in the Braves organization. He went on to play defensive back at the University of Cincinnati before earning his bachelor's degree in psychology in 1986. During his undergraduate studies, Meyer also became a brother of the Sigma Chi Fraternity, and met his wife at Sigma Chi's Derby Days philanthropy event. Meyer went on to earn his master's degree in sports administration at Ohio State University in 1988. Meyer married his wife, Shelley Mather Meyer, in 1986. The Meyers have three children: Nicole ("Nicki"), Gigi and Nathan ("Nate"). His oldest daughter, Nicki, is a freshman volleyball player for Georgia Tech. In October 2008, coach Urban Meyer and head University of Florida basketball coach Billy Donovan were named co-chairmen of an effort to raise $50 million to support the Florida Opportunity Scholars Program. This scholarship was designed for first-generation students that have unique needs and financial challenges. The Florida Opportunity Scholars Program was created by President Bernie Machen in 2006, and is intended to increase the opportunities for academically prepared first-generation students. In December of 2008, Meyer and Utah head coach Kyle Whittingham were the first people to donate money to the Elder Joseph B. Wirthlin Family Scholarship, an endowed scholarship which will benefit the Utah football program. Gatorzone.com, Football, Urban Meyer. Retrieved September 1, 2009. College Football Data Warehouse, All-Time Coaching Records, Urban Meyer Records by Year. Retrieved September 2, 2009. Associated Press, " Meyer, Stoops taking fast track to greatness," SI.com (January 1, 2009). Retrieved September 1, 2009. By winning the 2009 BCS Championship game on January 8, 2009, Meyer moved past Oklahoma head coach Bob Stoops into second place on the list of active Division I coaches ranked by winning percentage. Peter Kerasotis, " Notre Dame, Meyer seem like perfect fit," Florida Today (November 20, 2008). Retrieved September 1, 2009. Pat Dooley, " Urban Meyer: 'I'm not going to Notre Dame. Ever.'" Gainesville Sun (July 13, 2009). Retrieved September 1, 2009. Martin, Urban's Way, p. 66. College Football Data Warehouse, Bowling Green Yearly Results: 2000-2004. Retrieved September 2, 2009. Liz Abel, " Utah hires Urban Meyer as its new head coach," press release, University of Utah News Center (December 12, 2002). Retrieved September 1, 2009. Utah Football, Player Bio: Urban Meyer. Retrieved September 1, 2009. Matt Hayes, Coach of the year: Urban Meyer, Utah," Sporting News (December 15, 2003). Retrieved September 2, 2009. Kelley King, " Wild out West: Running mad in Urban Meyer's radical spread-option attack," Sports Illustrated (November 1, 2004). Retrieved September 1, 2009. Chris Brown, " The Florida Gator/Urban Meyer Offense," SmartFootball.com (December 2, 2008). Retrieved September 1, 2009. Associated Press, " Efficient Smith leads dominant win," ESPN.com (January 1, 2005). September 1, 2009. Ivan Maisel, " Notre Dame football exists only in history books," ESPN.com (December 6, 2004). Retrieved September 2, 2009.
" Bonuses become bonanza for Urban Meyer, Bob Stoops," Seattle Times (December 25, 2008). Retrieved September 2, 2009. Chris Low, " New deal in hand, Meyer is staying put at Florida," ESPN.com (August 3, 2009). Retrieved September 2, 2009. Andy Staples, " Meyer deal proves recession hasn't hurt big-time college programs," Sports Illustrated (August 3, 2009). Retrieved September 2, 2009. Associated Press, " South Carolina derails Gators' SEC East hopes," ESPN.com (November 12, 2005). Retrieved January 1, 2009. Associated Press, " Gators attack: Florida gets title with rout of Ohio State," ESPN.con (January 8, 2007). Retrieved September 1, 2009. College Football Data Warehouse, All-Time Coaching Records, Urban Meyer:2007. Retrieved September 1, 2009. SECSports.com, 2007 SEC Football Leaders. Retrieved September 1, 2009. Mark Schlabach, " Gators to alter style of play with loss of nine defensive starters," ESPN.com (August 7, 2007). Retrieved September 1, 2009. Associated Press, " Utah coach lauded for perfect season," ESPN.com (January 2, 2005). Retrieved September 5, 2009. Associated Press, " Florida QB Tebow is first underclassman to win Heisman," ESPN.Com (December 9, 2007). Retrieved September 5, 2009. National Football League, Draft History, 2005 Round 1. Retrieved September 5, 2009. Raymond Hines III, " Denise Meyer Chat Transcript," Gator Country (October 25, 2006). Retrieved September 1, 2009. Ken Sugiuera, " Daughter of Florida’s Meyer to play for Jackets," Atlanta Journal Constitution (Nov. 18, 2008). Retrieved September 1, 2009. University of Florida Foundation, Florida Opportunity Scholars, Billy and Urban's Challenge. Retrieved September 1, 2009. Nathan Crabbe, " Will Meyer donate big payday to UF scholarship fund?" Gainesville Sun (January 7, 2009). Retrieved September 1, 2009. University of Florida, Student Affairs, Florida Opportunity Scholars. Retrieved September 1, 2009. Gatorzone.com, Men's Basketball, " Billy Donovan and Urban Meyer Co-Chair Drive to Raise Scholarship Funds," press release (October 14, 2008). Retrieved September 1, 2009. Utah Football, " U. Athletics Establishes Joseph B. Wirthlin Scholarship: Kyle Whittingham, Urban Meyer are first contributors," press release (December 18, 2008). Retrieved September 1, 2009. Lee Benson, " Elder Wirthlin's goodness now a legacy at U.," Deseret News (January 16, 2009). Retrieved September 1, 2009. BGSU Football History, 2006 Bowling Green Football Media Guide. Retrieved September 12, 2009. Ute Record Book, 2006 Utah Football Media Guide. Retrieved September 12, 2009. Head Football Coach Urban Meyer, 2006 Gator Football Media Guide. Retrieved September 12, 2009. 2005-2006 Athletic Year in Review, 2006 Gator Football Media Guide. Retrieved September 12, 2009.